Humans recognize the period from about 1760 to 1840 as the industrial revolution where we transformed from hand-made to machine production. Since the beginning of the industrial age, the mean concentration of atmospheric carbon dioxide has increased from 280 parts per million to 400 parts per million. Carbon dioxide concentrations were much higher a half a billion years ago because Earth was a rocky planet bereft of carbon sequestrating plant life. 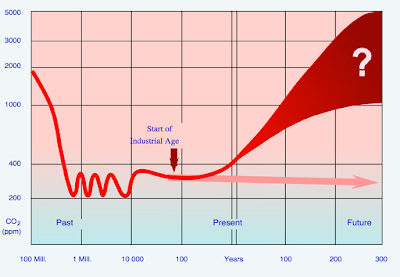 During the Devonian period 420 to 360 million years ago, Earth's atmosphere underwent a 15-fold decline in carbon dioxide. Much, if not most of life on Earth has an existential and symbiotic relationship with Earth's atmosphere. Animals must inhale and exhale to maintain life. Trees must sequester atmospheric carbon to grow a woody skeleton. Earth is planet of respiration. Earth is a breathing planet like no other planet we know. What we call ’I’ is just a swinging door, which moves when we inhale and when we exhale. A Breathing Planet, Off Balance, NASA, 12 November 2015. Excitement Grows as NASA Carbon Sleuth Begins Year Two, NASA/JPL-Caltech, 29 October 2015. The Forest Primeval, GrokEarth, 21 November 2015.